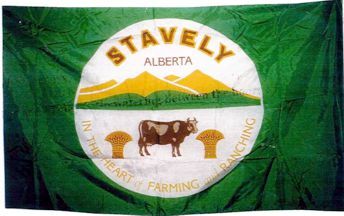 The town of Stavely Alberta (population: 497) is named after Stavely Hill, Managing Director of the Oxley Ranching Company that was founded in 1882. The municipal flag consists of a logo on a green background. On the logo is a cow, bushels of wheat, foothills and Rocky Mountains. The Town motto is “In the Heart of Farming and Ranching”. This photograph shows the flag as shorter with a round disk.